These bluegrass song lyrics are the property of the respective artist, authors and labels, they are intended solely for educational purposes and private study only. The chords provided are my interpretation and their accuracy is not guaranteed. These bluegrass lyrics and chords are intended for your personal use only. Bluegrass music began with elements of old time music and traditional music of the Appalachian region of the United States.The English, Irish, Scottish and German immigrants settled in the Appalachian area bringing with them the musical traditions of their homelands. 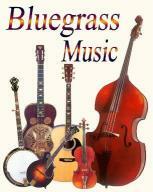 When the word bluegrass itself was adopted to label is not certain but many believe it to be in the early 1950's. It was likely derived from the name of the Blue Grass Boys band formed in 1939 with the great Bill Monroe being its leader. He will always be dubbed as the father of bluegrass music. You'll find bluegrass lyrics and chords from Earl Scruggs and Lester Flatt, Mac Wiseman, J.D. Crowe, The Stanley Brothers, Jim and Jesse, Doyle Lawson, Lonesome River Band and many others.